As modern organizations become more globalized and diverse, they require additional assistance to maintain effective workflows. With the support of numerous intermediary partners, businesses can enhance their various management processes. 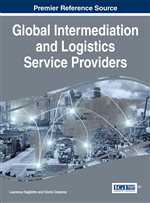 Global Intermediation and Logistics Service Providers is a comprehensive reference source for the latest scholarly material on outsourcing strategies in contemporary business environments and examines the role of intermediaries in the dynamics of decision-making and process management. Highlighting pivotal discussions across a myriad of relevant topics, such as open innovation, competitive advantage, and social capital, this book is ideally designed for professionals, practitioners, researchers, and students interested in the impact of service providers within industrial organizations.